Saint Catherine of Siena (March 25, 1347 - April 29, 1380) was a Dominican tertiary (lay affiliate) of the Dominican Order and a later Catholic saint. Born late in a very large family, she struggled to gain the support of her parents, but eventually won them over after her father had a vision of a dove hovering over her when she prayed. Catherine experienced a "Mystical Marriage" with Jesus around 1366, after which she began to attend the poor. She had visions which caused her to leave her secluded life and serve in the world. She wrote many letters to popes and men and women of influence for peace between the republics, for reforms of the clergy and the papal states, and for the return of the pope to Rome from Avignon. Pope Urban VI summoned her to Rome, where she lived until her death in 1380. Catherine was born in 1347, just four years after Julian of Norwich. She was the twenty-third child out of 25. (Her twin sister died at birth). Her parents were Giacomo di Benincasa, a cloth-dyer, and his wife, Lapa Piagenti, daughter of a local poet. Their large, three-storied home was situated next to the dye works. A native of Siena, Catherine received no formal education. At the age of six she had a vision of Christ wearing the papal tiara. 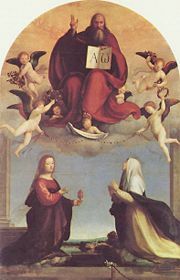 At seven she consecrated her virginity to Christ despite her family's opposition; in her eighteenth year she took the habit of a Dominican tertiary. The church and cloister of Saint Dominic were up the hill from her family home. Her brother-in-law's brother, Tomaso della Fonte, had earlier joined the Dominicans, and he became her first confessor. Wars raged everywhere, between nations, city-states, and even within the papacy itself. The plague also ravaged the area. These were extreme times, stimulating extreme devotion to God. Catherine's frustrated parents tried to marry her against her wishes. She responded by cutting off all her hair, which infuriated her parents. To discipline her, they made her the servant of the house, responsible for all the chores. She was showered with insults and humiliation, but she rejoiced at being able to serve her family, as if they were the "Holy family" of God. One day while turning the spit of the fire, she reportedly fell into ecstasy and rolled in the ashes, yet she revived unharmed. Still frustrated with her unwillingness to accept marriage, her parents did not allow her a refuge for prayer. She turned inward and created her own sanctuary in her mind. The power struggle with her parents finally ended when her father, upon entering her room, saw a white dove above Catherine while she prayed. After this, she was allowed to have her own room for seclusion and prayer and the freedom to offer alms to the poor, much to the chagrin of her siblings, who locked their doors to avoid the loss of their valuables. Her father, however, forbade anyone to interfere with her vocation. 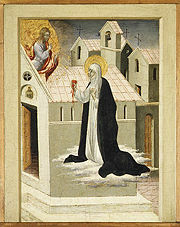 Catherine now wore a habit and white veil, which showed her to be a mantellata, a daughter of Saint Dominic. She chose to become a tertiary, a member of the Sisters of Penance, mostly widows, who lived in their own homes. A bout with chicken pox left scars on her face which she actually welcomed, for her former beauty no longer inspired the idea of marriage in others. She lived at her own home rather than in a convent, practicing acts of determined mortification. She wore a tight metal chain around her waist and carried on vigils and fasting. Her zealous use of "the discipline"—a leather thong used to flagellate oneself in the monastic tradition—caused much pain. She reportedly lived for long periods of time on nothing but the Eucharist. As she turned sincerely inward, her contemplative life opened up to powerful visions. She prayed in her room for over three years and discovered that the foundation for knowing God came from the principle: "Know that you are she who is not, and I am He who is." In about 1366, Catherine experienced what she described in her letters as a "Mystical Marriage" with Jesus, after which she began to tend the sick and serve the poor. She writes that she received an invisible betrothal ring from Jesus, which bestowed the gift of seeing into souls. In 1370, she received a series of visions of Hell, Purgatory, and Heaven, in a near-death experience. She told her confessor that she saw, "Everything in the other world that is to us invisible." However, she could not remain in this state, and upon awaking, she said, "now I am thrust back again into the prison of the body." After this experience she heard a command to leave her withdrawn life and enter the public life of the world. "Daughter," God told her, "conceive and give birth! Give birth to a race of men that shall hate sin and love Me with a great and burning love." She first served her growing extended family, whom she had seen little of in the three years of her self-imposed exile. She served them and loved them, attending with her father as he died. She also buried six nieces and nephews who died of the plague. Catherine received many men and women seeking her advice. She became the counselor and spiritual teacher to those who suffered. Miracles and exorcisms were attributed to her interventions. At about 25 years of age, she ceased eating much, and even when she prayed to eat, she usually threw up her food. She also slept little, and thus her weight halved and her physical strength waned. Yet, spiritually she became stronger and stronger. In a letter to her spiritual director, Raymond of Capua, concerning her inability to eat food, she wrote: "This is how we learn to enjoy eating souls. Souls are a food so sweet and mild that they make us fat, till we can enjoy no other food." Catherine dedicated her life to helping the ill and the poor, where she took care of them in hospitals or homes. She rounded up a group of followers, both women and men, and traveled with them along Northern Italy where they urged the reform of the clergy, the launch of a new Crusade, and advised people that repentance and renewal could be done through "the total love for God." Catherine also dedicated herself to the study of religious texts. She began to write letters to men and women in authority, especially begging for peace between the republics and principalities of Italy and for the return of the papacy from Avignon to Rome. She carried on a long correspondence with Pope Gregory XI, also asking him to reform the clergy and the administration of the Papal States. In her letters to the Pope, she often referred to him affectionately as "Papa" or "Daddy" (Babbo in Italian). In June 1376, Catherine went to Avignon herself as ambassador of Florence to make peace between the Papal States, but was unsuccessful. She impressed the Pope so much, however, that he returned his administration to Rome in January 1377. During the Western Schism of 1378, she was an adherent of Pope Urban VI, who summoned her to Rome. She stayed at Urban's court and tried to convince nobles and cardinals of his legitimacy. She lived in Rome until her death in 1380. The problems of the Western Schism would trouble her until the end of her life. Catherine died of a stroke in the spring of 1380, in Rome at the age of 33, the same age at which Jesus Christ died. The people of Siena wished to have her body. There is a legend that explains how Catherine's head was able to get to Siena. The people of Siena knew they could not get her whole body past Roman guards, and decided to take only her head, which they placed in a bag. They were still stopped by guards and they prayed to Catherine to help them because they knew Catherine would rather be in Siena. When they opened the bag to show the guards it no longer held her head, but was full of rose petals. Once they got back to Siena they reopened the bag and her head reappeared. Catherine is often depicted as holding a rose in accordance with this story. Catherine's Dialogue, which she wrote near the end of her life, is rich and complex in its expression of religious life. It is the summation of her learning and experience in her spiritual life. Both directness and intense in style, it contains four petitions: the first for Catherine herself, the second for the reform of the Church, the third for the welfare of the world and peace, and the fourth for the divine providence in general. Catherine also wrote about her visions and life experiences with God in her more than 300 letters, published under the title: Letters of Catherine Benincasa. Her writings, together with her courageous moral teaching to the great men of her day, resulted in her being declared a "Doctor of the Church" by the Catholic church in 1970. Catherine reported experiencing strong temptations during her mystical period, some sexual in nature, that alarmed her deeply. She prayed and struggled with these "demons" for days, and yet they did not leave her. She wondered where God was and why he did not dispel them. Jesus seemed to have vanished. She weakened in the struggle, but in the last moment she remembered to accept "the bitter as sweet," and to embrace the suffering which these horrific experiences brought her. Finally, she learned to laugh at the devil, and he was gone. Catherine asked Jesus where he had been during her trials when she had called upon him, and he replied that he had been in her heart the whole time. When she wondered why these horrible images had remained in her mind, he replied that had he not been there she would have found the visions pleasurable. She taught that God is often closest to when He is thought farthest away. Catherine's popularity grew so much that wherever she went, crowds followed her or joined her. Many people came out of the hills to be with her. A papal bull was eventually issued requiring that several priests travel with her to handle the many confessions that came from the people near her. During her stay at the castle in Rocca d'Orcia, four more priests had to join her because of the huge throngs of people. Raymond of Capua described his own and two other's exhaustion as they heard confessions far into the night. Statue of Catherine of Siena, just outside Siena, Italy. Catherine's letters are considered one of the great works of early Tuscan literature. More than of her 300 letters have survived. Her major work is the Dialogue of Divine Providence. Pope Pius II canonized Catherine in 1461. Her feast day is April 29 in the new Roman calendar and April 30 in the traditional Roman calendar. Pope Paul VI bestowed on her, in 1970, the title of Doctor of the Church—making her the first woman, along with Saint Teresa of Ávila, ever to receive this honor. In 1999, Pope John Paul II named her one of the patron saints of Europe. Saint Catherine is also the patroness of the U.S. Catholic sorority, Theta Phi Alpha. Catherine's body is currently interred in Rome, in the basilica Santa Maria sopra Minerva near the Pantheon. Her head and right thumb are in Siena, and her foot in Venice. St. Catherine is the patron saint of fire prevention and of Italy. She is considered a Doctor of the Church largely on account of her moral teaching in challenging great people such as the popes and other people of high authority in her day to work for goodness and peace. ↑ Carol Lee Flinders (1993), pg. 117. ↑ Carol Lee Flinders (1993), pg. 123-124. ↑ Raymond of Capua, trans. by George Lamb (1960). Curtayne, Alice. Saint Catherine of Siena. Rockford Il. : Tan Books and Publ., 1929/1980. Jorgensen, Johannes and Ingeborg Lund, trans. Saint Catherine of Siena. London: Longmans, Green, 1939. 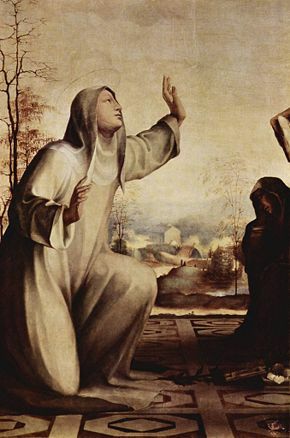 Works by Catherine of Siena. Project Gutenberg www.gutenberg.org. "St. Catherine of Siena" www.newadvent.org. Saint Catherine of Siena, Virgin www.ewtn.com. St. Catherine of Siena School in Reseda, California. www.catherineofsiena.org. History of "Catherine of Siena"
This page was last modified on 19 January 2017, at 16:28.